Fresh, locally sourced food served in amazing surroundings. 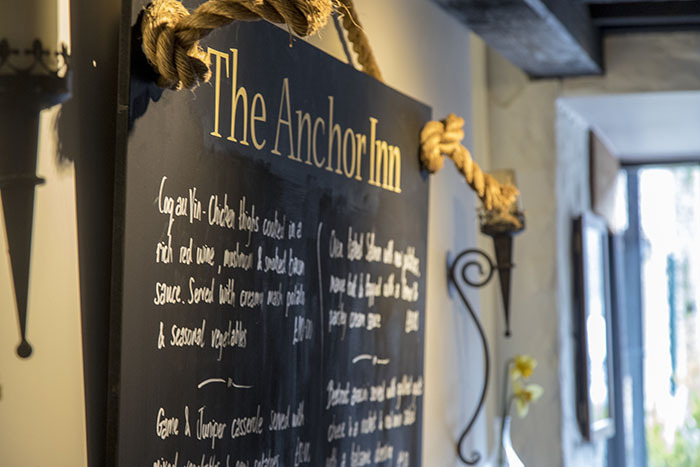 Hello and welcome to the new look Anchor Inn – like you’ve never seen it before. Weʼve preserved and enhanced this historic venue, with an extensive sympathetic restoration and development. 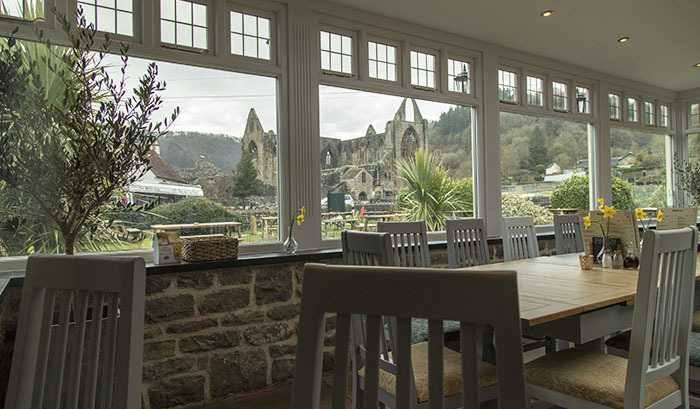 Our freehouse now offers more room, a real fire, garden terrace and extensive views of the Abbey – making The Anchor Inn the ideal location for food and drink in Monmouthshire. Weʼve also refreshed out outside spaces, with a large garden and kids play area. Our amazing and unique location is just one of the reasons people travel far and wide to visit us. Set in the picturesque Wye Valley on the English-Welsh border, Tintern is a postcard perfect location for visitors to the region. Based in the grounds of the famous Abbey, we have great views of the historic monument and the local landscape. Our own building is also highly unique, steeped in history. With large flat car parks and easily accessible from the M4 & M5, with Cardiff, Bristol & Gloucester reachable within the hour. We pride ourselves on our locally sourced fresh food, cooked on site. With something for everyone at lunch, dinner or something in between. Our extensive menus change seasonally and offer daily specials. 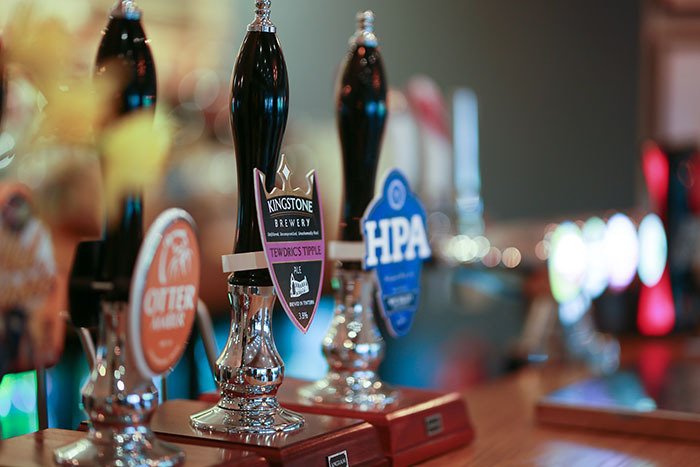 An extensive bar hosting a wide selection of real ales, ciders, soft drinks and a fantastic wine list. A childrenʼs menu as well as vegetarian and allergy friendly dishes offer great choice for all – served 7 days a week from 12 noon. Join us online for our latest news, oﬀers and events. Share your photos and reviews online and be kept up to date with everything that’s going on at the Anchor. Be the ﬁrst to hear of our new menus and special events. "The service and the food were wonderful. The new layout is absolutely brilliant and literally took my breath away. What an improvement!" 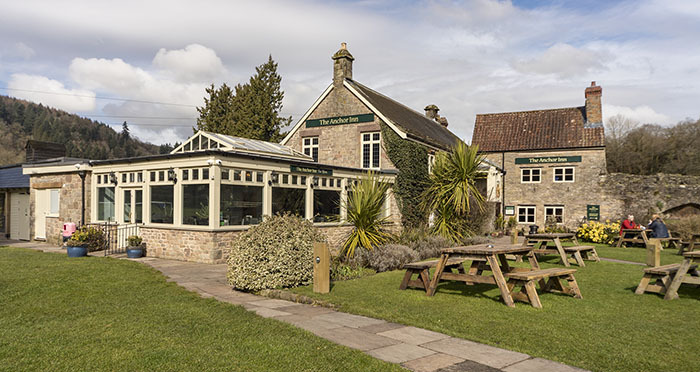 "I took a minibus with 14 people to visit the Abbey grounds and in particular this excellent Pub/Restaurant the staff were very friendly and helpful despite the fact it was busy. My whole group commented positively on the whole afternoon. Well recommended." "It's our favourite place to eat! Came on Mother's Day, which was our first visit since refurb and it's absolutely amazing! Food was as delicious as always and service was excellent as always." "Had a lovely lamb Sunday dinner here, friendly staff and quick service despite how busy they were..very welcoming for our dog too, just what we needed after a long walk to devils pulpit..highly recommend"
"Love this place, the food is the best and reasonably priced, lovely atmosphere and staff are really friendly. Looks amazing now it’s been refurbished too." "Amazing pub we found by chance on an excursion in the snow. Staff were absolutely fabulous and so lovely." "Cider mill over our dinner table! Great food and service!" "Thank you to the Anchor and all the chefs and waiting staﬀ for our lovely Mother's Day meal, all 18 of us really enjoyed it. We all felt really spoilt, thank you." "The food was sooo tasty, Deﬁnitely will recommend to all my friends"
The Tea Room is now closed for the winter season – reopening in the new year.